Providing you the best range of heating baths and heating mantles with effective & timely delivery. 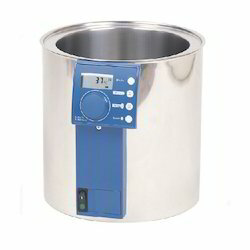 Heating Baths - With Coil and Heater are used with electrical or steam heating for glass vessel. Depending upon the temperature requirements, different types of thermic fluids or water can be used as heating media. Heating baths are provided with a pair of non flame proof heaters, M.S. Coil for passing the steam or cooling water, cushioned vessel holder, a bottom outlet sealing arrangement, a lid and threaded socket type or flange type inlet and outlets. Vessel Cap. (Ltr.) D L Loading Kw Cat. Ref. As an alternative to heating baths electric Heating Mantles can also be supplied for spherical vessels. Their heating power varies according to the nominal capacity of the vessel involved.These heating mantles are subdivided into several heating zones each of which is equipped with a temperature probe so that the surface temperature of the vessel can be monitored. These work in conjunction with the control unit included in the supply to prevent local hot spots occurring. The control unit also includes energy regulators, which can be used to control the heat input separately for each heating zone depending on the liquid level. Capacity Vessel D L Loading Kw Circuits Supply Cat. Ref.